The wav normalization and test is fulfilled on a peak level (Peak Normalization). The mp3 normalization and test is fulfilled on an average level (RMS normalization). The Sound Normalizer also allows editing ID3 tags (build-in Mp3 ID3 Tag Editor) with support for ID3v1 and ID3v2 tags, converting Wav to Mp3 files and Mp3 to Wav files (build-in Wav/Mp3 Converter) using Lame MP3 Encoder 3.97, listening Mp3 and Wav files using the build-in audio player. 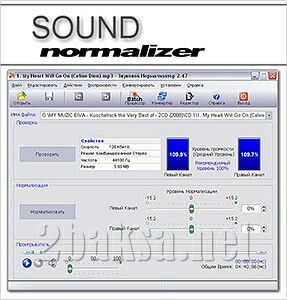 This Sound Normalizer is simple to use with fast and excellent quality results. It incorporates the Lame MP3 Encoder 3.97 encoding algorithms which generate crisp tantalizing quality audio.